Cassava in Peru, also known as mandioca in other countries- is one of the three more popular tubers next to the potato and the sweet potato. 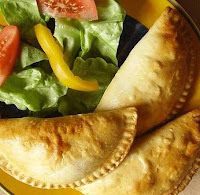 Today, we’ll see a special way to prepare the popular empanadas, using the cassava to make a pastry. You can use them also as snacks. Follow the recipe and you’ll get 30 pies. Peel the cassavas, put them in a pot and cover with water. Cook until they get very soft. Remove from the flame and press them with a fork. Remove the roots. Add the melted butter, yolks, parmesan and baking powder. Knead. Cut the pastry in half and spread on a floured surface. Cut circles of 6 cm (2.5 inches). Put cheese in the circle’s center and make the pie sealing the edge with your finger or with a fork. Repeat with the rest of the pastry and refrigerate 30 minutes. Before serving, heat vegetable oil in a frying pan, flour slightly the pies and fry them until they get brown. Remove from the flame and put them on paper towel. Serve 2 or 3 per person.